With so much going on at the moment and coming up its easy to miss things so here is a recap of the coming months in Plymouth as seen by VOSA. This little lot takes us up to the Stagecoach take over on the 7th September. As if this wasnt enough later in September we see another massive block of timetable changes, mostly as a result of Devon County Council cutbacks. More on these later. PH0004983/335 - FIRST DEVON & CORNWALL LTD, THE RIDE, CHELSON MEADOW, PLYMOUTH, PL9 7JT Variation Accepted: Operating between Plymouth Royal Parade and Saltash given service number 1/1A effective from 18-Aug-2015. To amend Timetable. PH0004983/337 - FIRST DEVON & CORNWALL LTD, THE RIDE, CHELSON MEADOW, PLYMOUTH, PL9 7JT Variation Accepted: Operating between Plymouth Royal Parade and Mount Batten given service number 2 effective from 18-Aug-2015. To amend Timetable. PH0004983/336 - FIRST DEVON & CORNWALL LTD, THE RIDE, CHELSON MEADOW, PLYMOUTH, PL9 7JT Variation Accepted: Operating between Plymouth Royal Parade and St Budeaux Square given service number 3 effective from 18-Aug-2015. To amend Route and Timetable. PH0004983/278 - FIRST DEVON & CORNWALL LTD, THE RIDE, CHELSON MEADOW, PLYMOUTH, PL9 7JT Variation Accepted: Operating between THE GEORGE PARK AND RIDE SITE and PLYMOUTH (Royal Parade) given service number PR1 effective from 18-Aug-2015. To amend Timetable. PH0004983/294 - FIRST DEVON & CORNWALL LTD, THE RIDE, CHELSON MEADOW, PLYMOUTH, PL9 7JT Variation Accepted: Operating between Coypool Park & Ride Site and Royal Parade given service number PR2 effective from 18-Aug-2015. To amend Timetable. PH1101608/9 - TREVELLYAN JACKETT T/A JACKETT'S COACHES, KINGSETT HOUSE,, ALBASTON, GUNNISLAKE, PL18 9AL Cancellation Accepted: Operating between Derriford Hospital and Chaddlewood given service number 52 effective from 29-Aug-2015. PH0000135/169 - PLYMOUTH CITYBUS LTD, MILEHOUSE, MILEHOUSE ROAD, PLYMOUTH, PL3 4AA Variation Accepted: Operating between PLYMOUTH, ROYAL PARADE and PLYMOUTH, ROYAL PARADE given service number 10/10A/10B effective from 30-Aug-2015. To amend Route and Timetable. PH0000135/166 - PLYMOUTH CITYBUS LTD, MILEHOUSE, MILEHOUSE ROAD, PLYMOUTH, PL3 4AA Variation Accepted by SN: Operating between Saltash, Fore Street and Liskeard, Ballas Street given service number 11 effective from 30-Aug-2015. To amend Timetable. PH0000135/161 - PLYMOUTH CITYBUS LTD, MILEHOUSE, MILEHOUSE ROAD, PLYMOUTH, PL3 4AA Variation Accepted: Operating between Launceston, Westgate Street and Bude, The Strand given service number 12 effective from 30-Aug-2015. To amend Timetable. PH0000135/162 - PLYMOUTH CITYBUS LTD, MILEHOUSE, MILEHOUSE ROAD, PLYMOUTH, PL3 4AA Variation Accepted: Operating between Plymouth, Royal Parade and Launceston, Westgate Street given service number 12 effective from 30-Aug-2015. To amend Timetable. PH0000135/100 - PLYMOUTH CITYBUS LTD, MILEHOUSE, MILEHOUSE ROAD, PLYMOUTH, PL3 4AA Variation Accepted: Operating between St Budeaux, Square and St Budeaux, Square given service number 21/21A effective from 30-Aug-2015. To amend Timetable. PH0000135/150 - PLYMOUTH CITYBUS LTD, MILEHOUSE, MILEHOUSE ROAD, PLYMOUTH, PL3 4AA Variation Accepted by SN: Operating between Royal Parade and Torpoint HMS Raleigh given service number 32/32B effective from 30-Aug-2015. To amend Timetable. 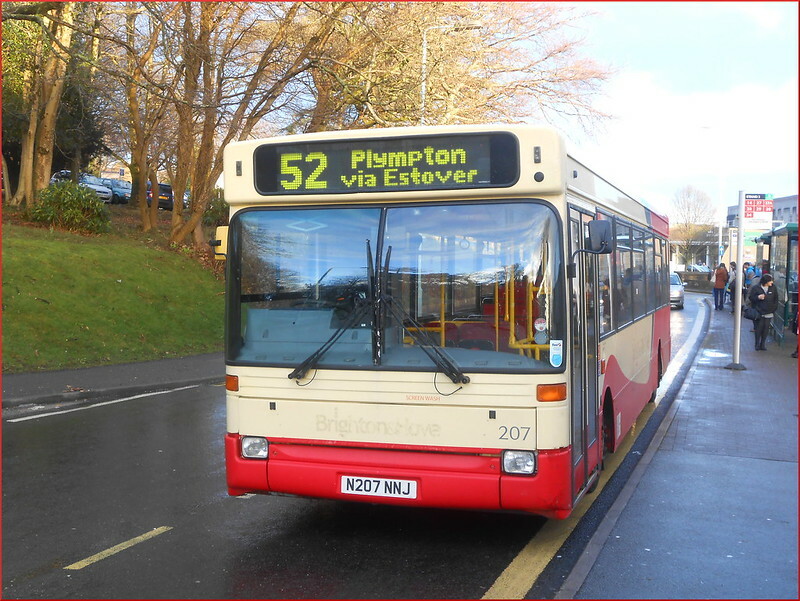 PH0000135/42 - PLYMOUTH CITYBUS LTD, MILEHOUSE, MILEHOUSE ROAD, PLYMOUTH, PL3 4AA Variation Accepted: Operating between PLYMOUTH Royal Parade and HAM Merrivale Road given service number 35/35A effective from 30-Aug-2015. To amend Route and Timetable. PH0000135/13 - PLYMOUTH CITYBUS LTD, MILEHOUSE, MILEHOUSE ROAD, PLYMOUTH, PL3 4AA Variation Accepted: Operating between Derriford Hospital and Ernsettle given service number 50 effective from 30-Aug-2015. To amend Timetable. PH0000135/165 - PLYMOUTH CITYBUS LTD, MILEHOUSE, MILEHOUSE ROAD, PLYMOUTH, PL3 4AA Variation Accepted: Operating between Liskeard, Barras Street and Callington, New Road given service number 74 effective from 30-Aug-2015. To amend Timetable. PH0004983/75 - FIRST DEVON & CORNWALL LTD, THE RIDE, CHELSON MEADOW, PLYMOUTH, PL9 7JT Variation Accepted: Operating between Roborough Bypass and Tor Bridge High given service number 804/805 effective from 30-Aug-2015. To amend Route and Timetable. PH0004983/467 - FIRST DEVON & CORNWALL LTD, THE RIDE, CHELSON MEADOW, PLYMOUTH, PL9 7JT Variation Accepted: Operating between DEVONPORT and COOMBE DEAN SCHOOL given service number 806 effective from 30-Aug-2015. To amend Route and Timetable. PH1020218/3 - DEALTOP (PLYMOUTH) LTD T/A TARGET TRAVEL, LANGAGE SCIENCE PARK, WESTERN WOOD WAY, PLYMOUTH, PL7 5BG Registration Accepted Starting Point: Derriford Hospital Finish Point: Derriford Hospital Via: Estover, Plympton Service Number: 52 Service Type: Normal Stopping Effective Date: 01-SEP-2015 Other Details: Monday to Friday except bank holidays. PH1020218/3 - DEALTOP (PLYMOUTH) LTD T/A TARGET TRAVEL, LANGAGE SCIENCE PARK, WESTERN WOOD WAY, PLYMOUTH, PL7 5BG Variation Accepted by SN: Operating between Derriford Hospital and Derriford Hospital given service number 52 effective from 01-Sep-2015. To amend Timetable. PH0004983/335 - FIRST DEVON & CORNWALL LTD, THE RIDE, CHELSON MEADOW, PLYMOUTH, PL9 7JT Cancellation Accepted: Operating between Plymouth Royal Parade and Saltash given service number 1/1A effective from 06-Sep-2015. PH0004983/337 - FIRST DEVON & CORNWALL LTD, THE RIDE, CHELSON MEADOW, PLYMOUTH, PL9 7JT Cancellation Accepted: Operating between Plymouth Royal Parade and Mount Batten given service number 2 effective from 06-Sep-2015. PH0004983/336 - FIRST DEVON & CORNWALL LTD, THE RIDE, CHELSON MEADOW, PLYMOUTH, PL9 7JT Cancellation Accepted: Operating between Plymouth Royal Parade and St Budeaux Square given service number 3 effective from 06-Sep-2015. PH0004983/463 - FIRST DEVON & CORNWALL LTD, THE RIDE, CHELSON MEADOW, PLYMOUTH, PL9 7JT Cancellation Accepted: Operating between Plymouth, Royal Parade and Laira given service number 6/Purple effective from 06-Sep-2015. PH0004983/396 - FIRST DEVON & CORNWALL LTD, THE RIDE, CHELSON MEADOW, PLYMOUTH, PL9 7JT Cancellation Accepted: Operating between Plymouth City Centre and Woolwell, School Drive given service number 15/15A effective from 06-Sep-2015. PH0004983/429 - FIRST DEVON & CORNWALL LTD, THE RIDE, CHELSON MEADOW, PLYMOUTH, PL9 7JT Cancellation Accepted: Operating between Wembury and Burrator given service number 48 effective from 06-Sep-2015. PH0004983/471 - FIRST DEVON & CORNWALL LTD, THE RIDE, CHELSON MEADOW, PLYMOUTH, PL9 7JT Cancellation Accepted: Operating between Exeter Bus Station and Princetown given service number 48 effective from 06-Sep-2015. PH0004983/186 - FIRST DEVON & CORNWALL LTD, THE RIDE, CHELSON MEADOW, PLYMOUTH, PL9 7JT Cancellation Accepted: Operating between PLYMOUTH Bretonside Bus Station and LAUNCESTON Westgate Street given service number 76 effective from 06-Sep-2015. PH0004983/499 - FIRST DEVON & CORNWALL LTD, THE RIDE, CHELSON MEADOW, PLYMOUTH, PL9 7JT Cancellation Accepted: Operating between Tavistock Bus Station and Callington, Callington School given service number 79 effective from 06-Sep-2015. PH0004983/35 - FIRST DEVON & CORNWALL LTD, THE RIDE, CHELSON MEADOW, PLYMOUTH, PL9 7JT Cancellation Accepted: Operating between TORPOINT FERRY and PLYMOUTH Bus Station given service number 81/81D effective from 06-Sep-2015. PH0004983/307 - FIRST DEVON & CORNWALL LTD, THE RIDE, CHELSON MEADOW, PLYMOUTH, PL9 7JT Cancellation Accepted: Operating between Tavistock Bus Station and Courtlands given service number 89 effective from 06-Sep-2015. PH0004983/36 - FIRST DEVON & CORNWALL LTD, THE RIDE, CHELSON MEADOW, PLYMOUTH, PL9 7JT Cancellation Accepted: Operating between Dartmouth Pontoon and Dartmouth Pontoon given service number 90/90A/90B/90C effective from 06-Sep-2015. PH0004983/38 - FIRST DEVON & CORNWALL LTD, THE RIDE, CHELSON MEADOW, PLYMOUTH, PL9 7JT Cancellation Accepted: Operating between Kingsbridge Quay and Dartmouth Pontoon given service number 93 effective from 06-Sep-2015. PH0004983/389 - FIRST DEVON & CORNWALL LTD, THE RIDE, CHELSON MEADOW, PLYMOUTH, PL9 7JT Cancellation Accepted: Operating between Plymouth, Royal Parade and Kingsbridge Quay given service number 93 effective from 06-Sep-2015. PH0004983/448 - FIRST DEVON & CORNWALL LTD, THE RIDE, CHELSON MEADOW, PLYMOUTH, PL9 7JT Cancellation Accepted: Operating between Gunnislake Station and Okehampton Station given service number 187 effective from 06-Sep-2015. 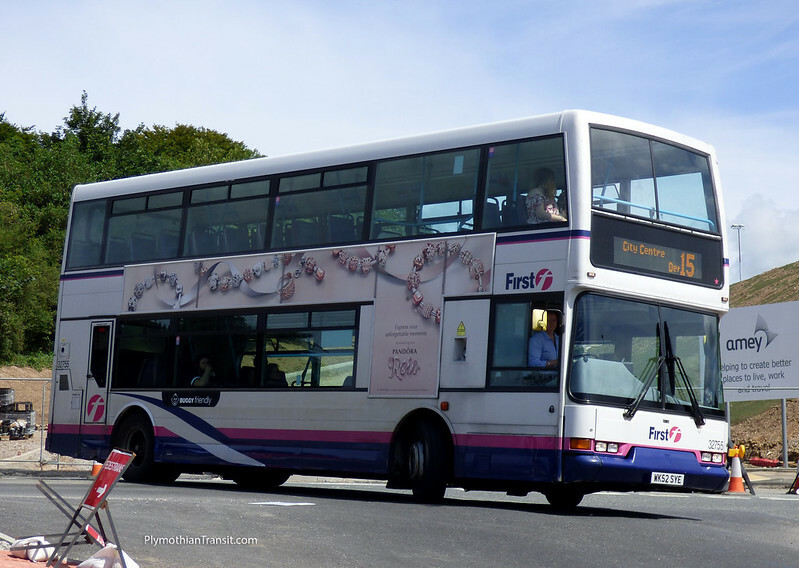 PH0004983/75 - FIRST DEVON & CORNWALL LTD, THE RIDE, CHELSON MEADOW, PLYMOUTH, PL9 7JT Cancellation Accepted: Operating between Roborough Bypass and Tor Bridge High given service number 804/805 effective from 06-Sep-2015. PH0004983/467 - FIRST DEVON & CORNWALL LTD, THE RIDE, CHELSON MEADOW, PLYMOUTH, PL9 7JT Cancellation Accepted: Operating between DEVONPORT and COOMBE DEAN SCHOOL given service number 806 effective from 06-Sep-2015. PH0004983/120 - FIRST DEVON & CORNWALL LTD, THE RIDE, CHELSON MEADOW, PLYMOUTH, PL9 7JT Cancellation Accepted: Operating between Woolwell and Coombe Dean School given service number 808/807/809 effective from 06-Sep-2015. PH0004983/278 - FIRST DEVON & CORNWALL LTD, THE RIDE, CHELSON MEADOW, PLYMOUTH, PL9 7JT Cancellation Accepted: Operating between THE GEORGE PARK AND RIDE SITE and PLYMOUTH (Royal Parade) given service number PR1 effective from 06-Sep-2015. PH0004983/294 - FIRST DEVON & CORNWALL LTD, THE RIDE, CHELSON MEADOW, PLYMOUTH, PL9 7JT Cancellation Accepted: Operating between Coypool Park & Ride Site and Royal Parade given service number PR2 effective from 06-Sep-2015. The end of First in Plymouth. It remains to be seen how many of their buses hang around with Stagecoach for their new operations. PH1020951/249 - STAGECOACH DEVON LTD T/A Stagecoach South West, BELGRAVE ROAD, EXETER, EX1 2LB Registration Accepted Starting Point: Plymouth Finish Point: Tavistock Via: Service Number: 1 Service Type: Normal Stopping Effective Date: 06-SEP- 2015 Other Details: Daily Service. PH1020951/197 - STAGECOACH DEVON LTD T/A Stagecoach South West, BELGRAVE ROAD, EXETER, EX1 2LB Variation Accepted: Operating between Torquay Strand and Totnes Royal Seven Stars given service number GOLD effective from 07-Sep-2015. To amend Timetable. PH1020951/198 - STAGECOACH DEVON LTD T/A Stagecoach South West, BELGRAVE ROAD, EXETER, EX1 2LB Variation Accepted: Operating between Totnes Royal Seven Stars and Plymouth given service number GOLD effective from 07-Sep-2015. To amend Timetable. PH0004983/401 - FIRST DEVON & CORNWALL LTD, THE RIDE, CHELSON MEADOW, PLYMOUTH, PL9 7JT Cancellation Accepted: Operating between Harford Bridge and Tavistock given service number 1 effective from 06-Sep-2015. PH0004983/403 - FIRST DEVON & CORNWALL LTD, THE RIDE, CHELSON MEADOW, PLYMOUTH, PL9 7JT Cancellation Accepted: Operating between Yelverton and Tavistock given service number 3 effective from 06-Sep-2015. it says Operating between PLYMOUTH, ROYAL PARADE and PLYMOUTH, ROYAL PARADE for the 10/10a. is what VOSA messed up? Thats very common on VOSA. Simply the start and end point are the same as they treat one journey as out and back again. like a circular hence start and end points are the same. Very common and very annoying! VOSA only go on the information supplied by the operator on the registration form. Whilst each operator has their own "case worker" who may get some knowledge of the area over time, all registrations are dealt with centrally in Leeds. Therefore VOSA's knowledge of roads and areas of Plymouth is, no doubt, the same as our knowledge of Leeds. Add to that the fact that the quality and detail of registrations varies as much as the quality and types of buses used to collectively operate them and the lack of detail in some records is no surprise. The webpage which we are all looking at is really an electronic version of Notices & Proceedings, albeit with an archive facility, and its purpose is to allow people to object to registrations. No one does that, but I expect some operators keep an eye on its so that if Blogs Buses suddenly notices that Fly-by-Night Coaches have registered a copy of their most profitable route they can go to the Traffic Commissioner's office and ask for a copy of the registration. There is a fee for this, but the document will be made available. The registrations used to be filed at the area offices, and I remember be sent from Plymouth to Bristol with a company cheque to order copies of a number of registrations, and whilst I was there I asked to see the actual documents so I could note down as much as possible for my bosses ahead of the copies arriving in the post a few days later. Working as I now do at a local authority, I see registrations from that side of things, and when certain files disappear from the list, like PH1020951/236 at the moment we assume that it is a sign that Leeds are working on it. It's not unusual for us to do what we need to do to record the registration to find one or more of our batch is "missing", but it usually reappears the following day. "236" has been hidden for a while now, so we can conjecture that it has been sent to the TC herself for approval (and she does personally see all Short Notice applications), or it could simply be that the case worker has gone sick part way through the process. I work for another operator (out of the blog area) and I can attest to tracking competitor registrations and ordering copies when we wish to investigate further. Its something most operators would do. The two weekly N&P can be too late to respond to a competitor sometimes so its visited daily. Leeds allocate case workers to traffic areas, my operator friends in the adjoining county have the same case worker as my operation does. Short notice applications, as you say, have to be approved and seen by the TC. This causes an additional delay in accepting the application to register. A registration awaiting such clearance disappears off your live list completely. If you time your registration application for the 56 days (and your case worker is in the office) the registrations are turned around within 7 days. The replacement Western Greyhound registrations during March were turned around faster than this, suggesting the operators had timetables ready to go. Depending on the method you use to construct timetables it can take minutes or hours. VOSA are very lax at updating registered particulars too as another commenter identifies, I have services still using defunct route numbers and incorrect terminal points because Leeds has not updated them even after we've alerted them to the error and after we've sent the variation application in the usual 56 day timeframe. This is a another new piece of Stagecoach and Go Cornwall competition I had not appreciated. 30 August STAGECOACH DEVON LTD - PH1020951/222, 6A Launceston - Bude timetable variation. Current this is just 1 early morning southbound and 2 evening returns. From 30th, 3 day time returns are added at 10:30, 12:30 & 14:30 from Launceston to Bude and back inter working with the Go Cornwall 12! The whole 6/6A is significantly re-timed. The Sunday 6A returns to a plain 6. So is Stagecoach operating into Saltash or not?